There is an old adage among criminal investigators that when you’re investigating something potentially huge, you don’t go for the biggest target first. Rather you work your way slowly and methodically, looking to peel away layers and trying to build up evidence. Crucially, you look to try and get some of the smaller fish to turn and provide evidence about the bigger fish. This is what Special Prosecutor Robert Mueller appears to be doing in regard to the Trump-Russia investigation. And in light of the latest developments, Donald Trump will surely be sleeping a little less easily. Michael Flynn, Trump’s former national security adviser, has pleaded guilty to lying to the FBI over a meeting he had with Russia’s then Washington Ambassador Sergey Kislyak on 29 December 2016, the same day Barack Obama imposed sanctions on Russia and expelled 35 diplomats in response for Moscow’s alleged interference in the 2016 election. 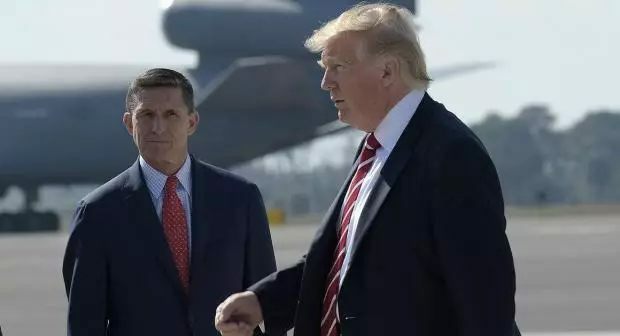 Along with Flynn’s guilty plea, was the revelation he was now working with Mueller as his investigation – initiated after Trump fired his FBI Director James Comey – moves forward. The plea deal specified Flynn must “cooperate fully, truthfully, completely, and forthrightly” on any investigations Mueller identifies as relevant. Prosecutors said Flynn said he had been directed to act by a senior member of the Trump transition team – an individual they did not identify. Separately, ABC News said Flynn was ready to testify that he was directed by Trump himself during the 2016 election campaign to make contact with Russian officials. We already know this is the way Mueller operates. In October, he charged Trump’s former campaign manager Paul Manafort and his former business partner Rick Gates with 12 counts of financial crimes related to their work in Ukraine. At the same time, he revealed foreign policy adviser, George Papadopoulos, had pleaded guilty to lying to the FBI – the same charge Flynn admitted. Some caveats are required for those salivating over the prospect of Trump’s imminent demise: Trump had made plain his wish to reset relations with Russia, had delivered a speech stating such a point and invited Kislyak to attend. Furthermore, there is nothing wrong, or even strange, about a foreign policy official from a presidential campaign meeting with officials from foreign countries. Another thing to bear in mind is that there have been many instances when it appeared Trump was doomed. In July, it was revealed that Trump’s eldest son, his son-in-law and Manafort held a meeting in Trump Tower in June 2016 with a Kremlin-linked lawyer who had allegedly offered to provide them with dirt about Hillary Clinton. Many cited this as proof of collusion, yet Trump said “anyone” would have taken such a meeting. As of yet, no charges have been brought over that get-together. It is clear how the White House intends to deal with this latest issue. “Nothing about the guilty plea or the charge implicates anyone other than Mr Flynn,” Ty Cobb, a White House lawyer, said in a statement. Trump’s lawyers had long been preparing for this moment. They clearly had their answers ready. But this may not so easily be brushed aside. Papadopoulos was on the fringes of the Trump campaign; Flynn was not. He was a key adviser during the campaign and appeared at the Republican National Convention, where he delivered a fiery speech in which he attacked Hillary Clinton and led the crowd in chants of “lock her up”. In short, Flynn was not some bit player in the Trump world but someone very important. Presumably, he possesses an awful lot of information about Trump’s campaign that Mueller wants to hear about.